An artist wouldn’t be complete without his paintbrushes, and the same goes for your beauty regime. It’s all very well buying the latest contouring products, but if you don’t have the correct brush, you just won’t achieve the same effect. There are many different preferences when it comes to applying products such as foundation, but for some things, a brush is all you need to apply the finishing touches to a flawless look. Most make-up brush sets come with a range of styles to cater to all beauty regimes. The basic components of any make-up brush set should include an all-over shadow brush, an angled blusher brush, a bushy powder brush and a straight foundation brush. These should allow you to apply a daytime look with ease. However, if you want to achieve a more complex look, then larger sets can include items such as blending brushes, brow brushes and fan brushes. If you have perfected the difficult art of contouring, there tend to be separate kits out there dedicated to this trend. There are also dedicated travel brush sets for those who want to look good on the go, and vegan-friendly bristles, and funky coloured sets that will look pretty on your dressing table. 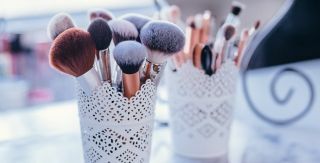 If you’ve not tried using make-up brushes before or you don’t want to spend too much on them, there are plenty of great sets around that won’t break the bank. However if you’re a budding make-up artist or beauty vlogger, you may want to invest a little bit more in a full set that will last you for years to come. We’ve picked our 6 favourite sets below. Ready. Set. Contour. The Zoeva Rose Gold Brush Set is bang on trend and will look elegant and professional on your dressing table. If you are looking to invest in a decent brush set to take you from day to night then this one gets the job done superbly. You’ll be able to achieve anything from winged eyeliner to contouring with the utmost perfection. These small brushes are the best make-up brushes for travel because they fit neatly in your handbag in a convenient carry case. If you’re going away for the weekend then you’ll want to have the Sigma Beauty Travel Kit with you. Despite being a travel kit, you still get a comprehensive range of 7 brushes to achieve a range of day and night-time looks wherever you are. Although the cheapest on our list, the Real Techniques Core Collection is by no means the least impressive. If you’re venturing into the make-up brush world for the first time, then this simple set will get you started nicely. You’ll get the essential four brushes for creating a flawless daytime look, making these the best make-up brushes for beginners. Once you have this set you can build on it to add more brushes as you practice your look. If you’re one of the lucky ones who have perfected the art of contouring, then why not brighten up your make-up bag with these beautiful brushes? This is a set of four that is vegan-friendly, cruelty-free and ultimately the best make-up brushes for contouring on the market. If you’re looking to give contouring a try, then we think this set is very reasonably priced, and they look pretty funky, too. For a full set of brushes that will take you from day to night anywhere in the world, then the Morphe 15 Piece Vegan Pro Set is ideal. It comes in a handy carry-case which is ideal for travel and we love that it is completely synthetic and animal-friendly. From primer right through to smoky eyes; there’s a brush for every look.